After a phenomenal early season of fishing activity on the offshore waters of the Tofino area, July is a welcome time for local anglers and visitors alike. The inshore waters of Tofino-Clayoquot Sound now becomes the arena for consecutive battles with some of the north Pacific’s finest combatants. We are not talking about war ships or protests, I’m referring to the aquatic variety of fighters that are respected as well as any other along the B.C. coastline. Oncorhynchus tshawytscha and Oncorhynchus kisutch, more commonly known as Chinook and Coho Salmon, frequent our local waters throughout the remainder of the season. With the combination of abundant baitfish and prime feeding habitat, the local waters of Clayoquot Sound provide an idyllic setting for the fish as well as the fisher. With a combination of protected waters and world class scenery, the “backyard” of local anglers has become known to be some of the finest on the coast, especially for the enthusiasts of light tackle and Saltwater Fly fishing. Some of the most productive waters to focus your pursuit of hard fighting, ocean bright salmon are along the outer coastline from Tofino. Local hotspots with names like B.S. Pass, the Glory Hole, Zipper Lip and the Shortcut, are all well known but not over-fished. Common names for other main spots include Wilf Rock, Bartlett Island, Blundan Island and Kutcous Pt. The best consideration for the month of July would be to fish the outer area of Bartlett Island on an incoming tide, as well as the gap along the north-eastern tip of Bartlett, also known as B.S Pass. For the outer waters, consider a medium Herring or Anchovie behind a Blue or Purple Glow flasher at the 80-100 ft depth. Brown Squid hoochies tied 42-48 inched behind your flasher are also a good standby. These hot combos are known to entice both Chinook and Coho Salmon in this area. When fishing the pass, you will have to shallow up your gear to the 20 ft depth, with the bottom being fairly soft sand. The previously mentioned gear will still work well, but for some of the absolute best Coho fishing available, consider trolling a little faster with small spoons behind a mini flasher. With Needlefish being the main bait fish in this area, small spoons like the thin metal “Coho Killer”, the 3 inch Gypsy or Coyote, as well as small needlefish hoochies are all part of the recipe for success. This area of Clayoquot Sound has a retention limit of two (2) Chinook salmon and two (2) Coho Salmon per person per day. The Chinook must be at least 45 cm. while the Coho must be at least 30 cm. and can be marked or unmarked (wild or hatchery). Make sure to consult with current local regulations and boundaries for these great fishing opportunities. 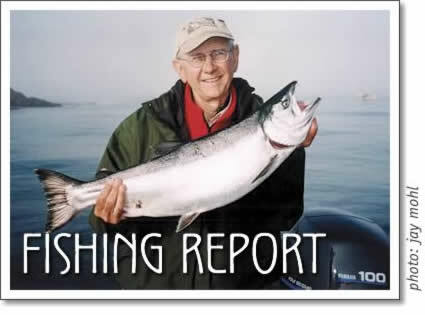 Tofino fishing report by Tofino fishing guide Jay Mohl. Published in July 2004 by Tofino Time Magazine in Tofino.